On our arrival at Lake Kariba our attention was drawn to someone. He was sitting on the water-level balcony with legs immersed in the cool water of Lake Kariba. Despite the peaceful afternoon he looked troubled. You would think it was something physical bearing hard on him considering the manner and emphasis of the brow on his forehead. It was not even love as an issue here. He was admiring the beautiful landscape, the expanse of the inland sea. But what was the trouble? You could “hear” the thought process in gear. Searching for ideas to harness this beauty. Even though the opportunity was sitting right there. Siavonga town on the lakeshores! You might want to work out the figures in your head. But investment in tourism is considered to be relatively high. But you can 'soften' the impact of the high cost. First off, consider the use of designs that mesh well with the landscape. You may involve the use of raw materials that are locally found such as stones, trees and timber (lumber). It is important to note the lumber industry in Zambia is very large and relatively unexploited. At your beck and call you can get hold of both the soft wood and hard wood such as teak, mahogany, native timber like mukwa, etc. On the other hand the Zambia Investment Center (ZIC) will provide information on investment opportunities. If you ask ZIC will gladly assist you with information on available investments including those to do with water and wetlands resources. Just think about. An an investment involving water activities such as boating, canoeing, fishing, even boat skiing could be interesting. How about honeymooners? Provide a houseboat for hire for those who would enjoy watching exquisite sunsets and sunrises that only Africa can provide on Lake Kariba . And there is stargazing too! Siavonga is on the water front and it is a tourist town too. It is the new and emerging tourist resort area. Just imagine a boat cruise on an inland ‘sea’ that would start off from somewhere in the vicinity of Livingstone, the home of the Adventure Centre near the Victoria Falls area. 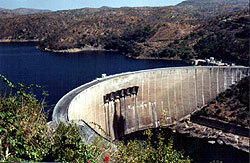 The boat cruise would then travel down stream to the Lake Kariba Dam wall (nearly 300 km as the crow flies). Should you want to drive to the dam wall and Siavonga town it takes only a couple of hours from Lusaka, capital of Zambia. Siavonga, is a small rural town on the shores of Lake Kariba. It is hilly and mountainous. This provides a great challenge to enthusiasts of 4x4 driving and in the rift valley! Lake Kariba is a man-made lake that filled a rift valley. As a result there are so many interesting islands (hills really). The new guesthouses and lodges are built on the shores of the lake. These are really houses on the water’s edge! A lot of fishing and exciting water activities take place here. And myths and other real stories such as the one about rescuing wildlife when the water started to fill the valley. This tourist destination is recommended to those who like the less visited tourist resorts. And Siavonga is that great place. It has great investment potential for tourism too!.